Congratulations to our team for a successful audit and re-certification of our drones operations working under the Civil Aviation Authority (CAA) of NZ. The team showed their professionalism and attention to detail throughout the re-certification process and this has now been extended through to maximum allowable 5 years (2023). 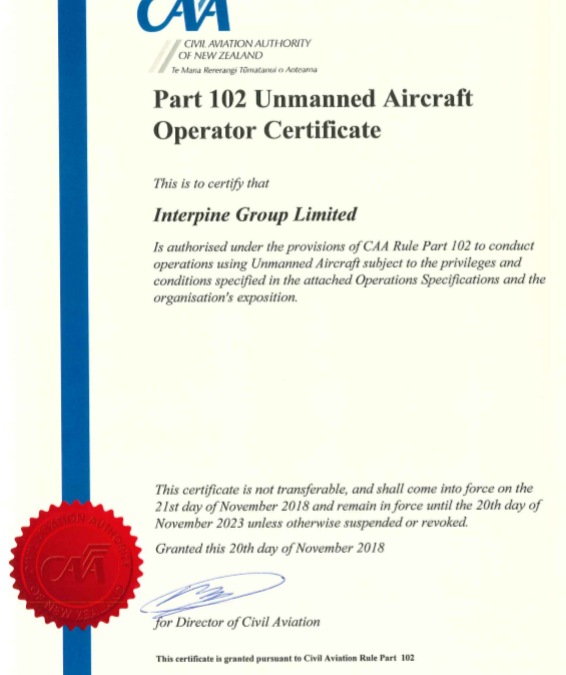 Interpine continue to lead the forestry and rural fire emergency sectors in our approach and deployment of drone operations, from being the first organisation in these industries to become certified to now extending this certification for the maximum period permitted. We look forward to continuing to work with industry and the CAA to progress the applications and use of drones while continuing our drive for a “best practice approach”. What does being CAA CAR 102 Certified Mean ?